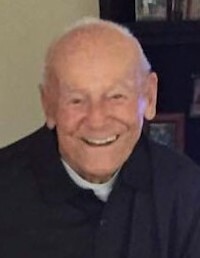 John William “Mickey” Judge, 93, of Louisburg, passed away November 26, 2018 at WakeMed Hospital. He was born in Buffalo, NY to the late Joseph and Walerya Frys Judkiewicz. Mickey was a veteran of the US Navy having served in WWII. After his military service, he began a career with the Niagara Frontier Transportation Authority until retiring after 30 years of service. Since moving to North Carolina in 1998, he began working at different Kroger and Harris Teeter Grocery Stores. The Harris Teeter Store in Wakefield was his final store, where he took pride in working hard and lifting people’s spirits. He was also a faithful parishioner of Our Lady of the Rosary Catholic Church. Mr. Judge was a member of the Knights of Columbus since 1948 and served where ever there was a need. His presence will not only be missed by his family but by everyone he met. A Mass of Christian Burial will be held at 2 o’clock, Thursday afternoon, November 29, 2018 at Our Lady of the Rosary Catholic Church, 2227 Hwy 39/401 N Louisburg, NC. Inurnment will be held at a later date at Holy Cross Cemetery. Mr. Judge is survived by his stepchildren, Donna Marie Duffy of Louisburg, Patricia Duffy Drew & husband Ray of Wilmington, Margaret Duffy Thompson & husband Roger of Datil, NM and William M. Duffy & wife Patricia of McDonough, GA; 11 grandchildren; 26 great-grandchildren; 6 great-great-grandchildren; several nieces, nephews and many friends. He was preceded in death by his wife Elizabeth McWhorter Judge; six sisters and one brother. Memorial contributions can be made to Our Lady of the Rosary Catholic Church, P.O Box 593 Louisburg, NC 27549.